Boasting of a proudly DIY approach to the creation of their most recent E.P, Brooklyn’s Curelight Wounds make music that sound a lot better than the concept itself. DIY is good – but you’ve got to have heart and soul to go into it. 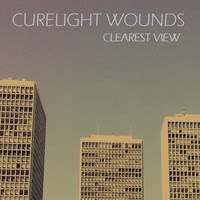 ‘Clearest Views’ shows the band definitely have said heart and soul and the music shines brighter as a result. The record was apparently recorded on a zero budget approach and although that independent attitude should over speak volumes it doesn’t for one major reason. You can’t hear over the music! That is no bad thing when this mostly one take collection is full of the energy you want in music but rarely get in any tangible form. With just three tracks we see why this release works so well. The E.P’s chaotic brevity is just enough to catch you unawares and make you listen but one track more and it could have been different. But possibilities are not what reviews are made of – we need some facts. The tonal stream of conscience lyrics, mostly distorted are effective and the raw DIY production ethos give the release an edge that impresses. This is an E.P. that wants to be heard and very loudly through the biggest speakers in your possession. Seek it out and ye shall not be disappointed!